Colour - Deep gold, with intense late-afternoon sunshine shades. Nose - Without water: Creamy, rich. Resinous fragrances swirl up before melting into a citrus fruit salad bowl. Lightly toasted pine nuts. Citrussy. Orange peel and candied grapefruit. A floral touch. Geranium, almond brandy snaps, vanilla toffee, fudge sauce. A tempting mellow bouquet for a sweet tooth! A dry spicy echo resonates in the back. Touch of liquorice. Water wakes up nutty and oaky aromas. Blancmange. Drying wood in a suntrap location. Rubbed on the hand - Freshly baked raisin buns, toasted brioche. Palate: Without water: Round, sweet, incredibly smooth and velvety. Wood is entirely integrated but present all the way, sweetly enveloping fruity and nutty flavours in an oaky shell. Luscious chocolate fudge fingers on taste buds. With water: Oak shows up through sweet and bitter flavours. Dark chocolate. Walnut peel. Water seems to unwind the bouquet, releasing more spices as well. The finish is drier. The finish is lingering, nutty. Toasted haelnuts, lightly smoked almonds. A distant spicy aftertaste. 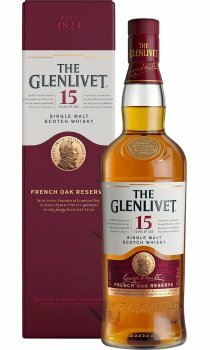 Oak gives the beat in the Glenlivet 15 Year Old French Oak Reserve. The influence of Limousin casks, the same that are used in Cognac, is obvious. They impart more oaky aromas (vanilla, bitter chocolate, creamy notes) than American oak. But it has achieved a remarkable smoothness, all edges cut and a rewarding complexity. The perfect dram for a sweet tooth. To be enjoyed after dinner, with a few dessert nibbles to complement its bakery bouquet. Better enjoyed with no water at all.